Not before time, some of the more advanced and enlightened provinces of China are to ban the widespread practice of giving patients antibiotic infusions for common colds. Visit any emergency department or outpatient department in a major Chinese hospital and you will see row after row of patients hooked up to IV infusion lines. These are people who have coughs, cold and fevers and are given intravenous antibiotics as routine therapy. In most other countries this would be seen as an absurd, unscientific and harmful overtreatment, but in China it is the norm. There is an almost superstitious belief among Chinese people that an infusion is a panacea. Many doctors have spoken out against the practice but until now hospitals and health authorities have done nothing to curb the practice. That may be all about to change. 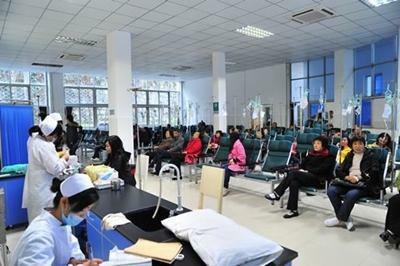 The Jiangsu health department has put hospitals on notice by saying that from 1 July 2016 infusions will no longer be permitted as routine therapy in outpatient departments of major hospitals (2nd and 3rd level). This will include city hospitals in cities such as Shanghai. In a recent interview with People's Daily, Xuzhou Medical College Professor Wu Yunming said the most appropriate treatment for a cold was to take a simple antipyretic such as aspirin, rest and drink plenty of fluid. "Sick people going to hospital for an infusion has become a long established bad habit, which is one of the important factors for antibiotic drug misuse," he said. Professor Wu said it was a practice that must be stopped but it would require a change of thinking among the public as well as among the medical profession. He said strict rules were needed to ban infusions because although doctors were aware that they were inappropriate, self regulation and guidelines had failed to curb their use. Professor Wu said it was typical for an outpatient department to have 200 patients in a morning having infusions - and not unknown for up to 700 patients a day receive such treatment. This was highly profitable for hospitals, which charged 100-200 per infusion, he said. "Hospitals are businesses and infusions represent a significant source of revenue for them," he noted. A reporter who visited a major hospital found that healthcare staff were sceptical about the planned ban. They say their was widespread patient expectation and demand for infusions, and if tertiary hospitals did not offer them then patients would simply go to smaller hospitals or local community health clinics that would still provide them. Professor Wu said rational use of antibiotics was an important issue because antibiotic infusions could cause anaphylactic reactions, increase resistance and also cause other major side effects on the kidney and liver. Infusions also wasted a lot of workforce capacity and resources as nurses had to set up and monitor infusions. He said there needed to be a system-wide plan and implementation of the infusion ban, with an emphasis on social responsibility for hospitals and professional responsibility for doctors. A spokesman for the Jiangsu department of health said it would be issuing a 'blacklist' of more than 50 medical conditions for which infusion was not permitted.